On Friday evening, in terrible storm and rain we left to Tallinn with two dogs - our miniature schnauzer Raven's Tot Feel The Rhythm and rabbit longhaired daschund Daks-Veg-As Zeta Jones (Zeta). 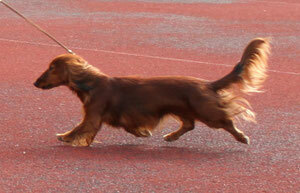 Our aim was to try luck on Estonian Winner 2012 - International Dog Show. First our Zeta stepped to the ring. Judge was Dorota Witkowska, Poland. After one year break in shows Zeta behaved well, moved with real drive and judge noticed our dear girl - she won Intermediate class, then became Best Female, getting Estonian Winner 2012 title, CAC and her first CACIB. 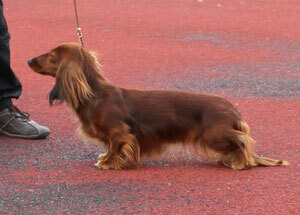 But as if it would not be enough - cherry on the top was Zeta's Best Of Breed placement! Than was Milla's turn. 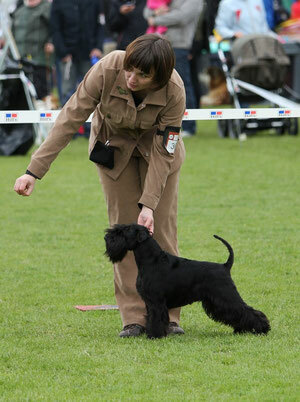 She was shown in Champion class, placed 2nd in class and 4th in Best Female competition.